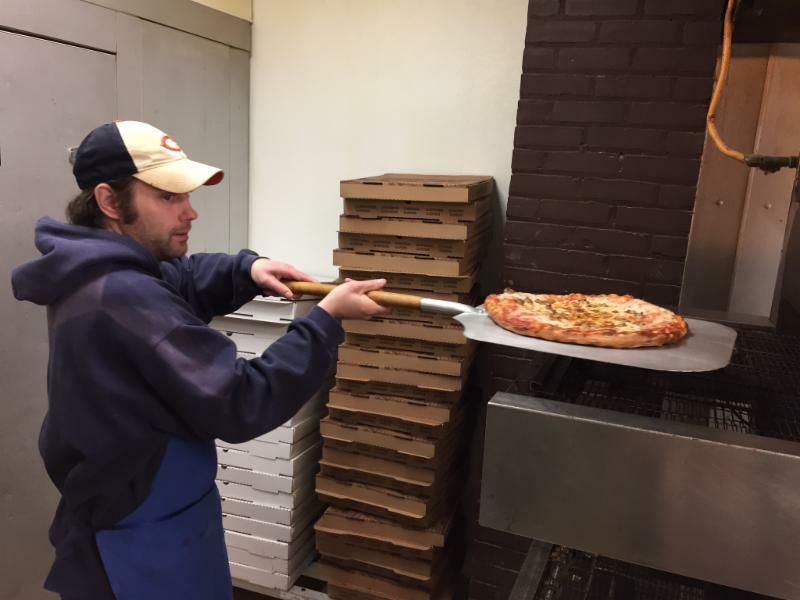 Open for over six months, Guppy's Pizza, located on 421 Water Street., won the Best New Business Award at Downtown Eau Claire Inc.'s Annual Awards Banquet February 25. The pizza parlor is run by Joel and Tanya Gupton, who took over the well-loved Jim's Pizza, which is the former go-to pizza place for college students. Joel, once an employee of Jim's Pizza, returned to the building, opening it as Guppy's and kept the menu relatively similar. "It's a good location with an exciting, energetic customer base," Gupton said. Joel said what they enjoy most about making pizzas is meeting the customers, and their most ordered item is pepperoni pizza. On the weekends, it's a different story. "We sell, on average, one mac and cheese pizza a week, but it's one of the top selling pizzas we make for slices on the weekend." Joel Gupton pulls a fresh, hot pizza from the oven. He and his wife thought about opening up other types of businesses, including a daycare, but ultimately decided that the pizza shop would be a good fit. Guppy's was off to a bumpy start when it opened, however. Gupton said the cooler broke when the shop first opened, so they had to use their marketing budget to cover the expenses, which led to more issues. The financial stress put them in danger of closing in November, shortly after opening in September. With support from the community and a generous helping hand from another business, Guppy's got back on track. Jordan Hedrington, owner of Bug Eyed Betty's recalled being in a similar situation and made a Facebook post on November 25, to encourage customers to eat at Guppy's instead. Since then, business has been booming and Guppy's is making its presence known on Water Street. The pizza joint has been receiving positive feedback from college students as well. "The owner was so nice and gave out deals to students who participated in SCORE (Student and Community Outreach on Rental Efficiency), so not only were they promoting their new pizza establishment, but encouraging college students to be more green," Betsy Bain, UW-Eau Claire junior, said. Hedrington said he is excited for Guppy's recent award recognition. "It's awesome, I'm incredibly happy for them. I'll always do anything I can to help out local businesses, so I'm happy to see them succeed."